MLA new pricing options – How they work! In response to customer demand and in order to continue to provide the best possible experience for our students, Marine Learning Alliance has introduced a number of new flexible payment options. Pay in advance – get a substantial discount for investing the cost as the start of your studies. Nothing further to pay. These are in addition to our standard model of Pay per module - as you study it, for complete flexibility. The costs of both of our Plymouth University degree offers: Advanced Hydrography and Sustainable Maritime Operations are lower than the full time equivalents and represent great value for money when ‘loss of earnings’ and living expenses are considered for our competitors. E-learning is a really cost-effective way to study. Research from the Sutton Trust (2013) shoes that someone with a Master’s Degree can expect to earn £5,500 more per year – or over £200,000 over a working life – than someone with a Bachelor’s degree. Other arrangements are also available for companies to sponsor students and for Service Leavers. The London Propeller Club’s March luncheon, held at The Naval Club in Mayfair, proved to be an occasion for interesting topical discussion and lively debate; together with excellent networking. Club President, Commander Ian Millen RN, took great pleasure in introducing three new members, Emma Buckels, Richard Bird and Barry Pettit. He was especially delighted to welcome Emma as the first, hopefully of many, student members to the Club. Ian also welcomed two guests to the luncheon - Adrian McCourt, Managing Director of Watkins Superyachts; and Guest Speaker, Adam Corney, Commercial Director of the Marine Learning Alliance (MLA). Adam began his career as a submarine officer with the Royal Navy in 1989, before coming ashore in 2000 to set up and run Marine South West, a not-for-profit company, concerned with business development of the marine sector. In 2011 he moved to Plymouth University as Marine Commercial Director and, subsequently, joined the MLA in 2014. Adam began by explaining how the MLA provides e-learning for mariners and seafarers, with the focus aimed at those serving at sea or those who have recently come back ashore. It started out as a business unit of Plymouth University in 2012, before becoming established as a spin-out company in 2014, as a wholly owned subsidiary of IMarEST. Their degree course is a mix of video lectures, with transcripts and exercises; coupled with support from a personal tutor. The course is workplace learning and takes between 2 – 3 years to complete, on a part-time basis. All those who are successful, earn a degree under the auspices of Plymouth University. Additionally, the MLA run a number of short, flexible e-learning courses; also working with companies to run bespoke courses. As an example, Adam cited the work they are doing with Bernhard Schulte Shipmanagement, who realised that their Marine Superintendents would benefit from the Leadership & Management Course, to help hone their ‘soft skills’. They see the ROI as the retention of good staff and improved customer service; which is interesting when compared to companies whose approach is very much short –sighted, in that they provide basic qualifications and no more. Adam said it has become apparent that there is a need to translate the experience and technical skills/qualifications into requirements for shore-based jobs and careers. It is essential to break down the barriers and prepare people to come ashore. Part of their solution to this, in partnership with the IMarEST, is for a Master’s ticket or CoC to count towards a degree – and, as each applicant is assessed individually, they can evaluate everyone on a personal basis. An added advantage for students is that they receive free membership of the IMarEST, which gives them access to their virtual library and other vital resources. Those present were impressed that the app works independently to the internet; so students can download their modules before going to sea, work at sea offline, then download their work once back ashore; a big plus point when seafarers still have limited access to the internet. There are currently 250 students from 50 countries taking the course and, with a large number of these not having English as their first language, which shows that there is a global desire for this type of upskilling. It was interesting to hear that there is almost a 50/50 split between companies sponsoring employees, and mariners paying to self-educate. Some people in the room questioned whether or not it was in a company’s interest to train someone and give them the skillset to go elsewhere, also whether it was the best use of your crew’s time to be encouraging them to take on ‘extra work’ whilst they were fully employed at sea; but there was a stronger feeling that, if you don’t train people and take an interest in their development, they may well go to a company that does. Also, if you don’t train your staff, you are only as good as the people you employ?! The general consensus in the room was that, anything that helps people to prepare for life after working at sea, and feel valued, can only be good. Ian thanked Adam for travelling up from Cornwall to speak at the luncheon, and for triggering such an interesting and lively debate. Ian reiterated that, anything that helps to engender employee loyalty, can only be good; technology is the way ahead and the MLA elearning scheme is definitely a step in the right direction - certainly better than the ‘correspondence course’ of yesteryear! We look forwarding to welcoming everyone to the next Propeller Club Luncheon, on Wednesday 20th April at the Naval Club, Mayfair. There are still (5) spaces available on the Advanced Hydrography Practical Residential Course starting 9 May. They are available to those wishing to study the topics of practical hydrography at sea, land surveying for hydrographers or updating in industry standard equipment and technology. We can be flexible about how much of the module is studied and the terms (course fees). Please contact our commercial director Adam Corney at adam.corney@mla-uk.com if you want to sign in or need more information. The Hydrographic Academy 3 week practical fieldwork Hydrographic course has been designed to provide students with an opportunity to learn, practice and demonstrate the practical skills necessary to conduct survey operations under the guidance of experienced surveyors and subject specialist academic staff. Timetabled practical sessions take place from 09:00 to 17:00 on each day from Monday to Friday with additional, optional tutorial sessions taking place each evening. 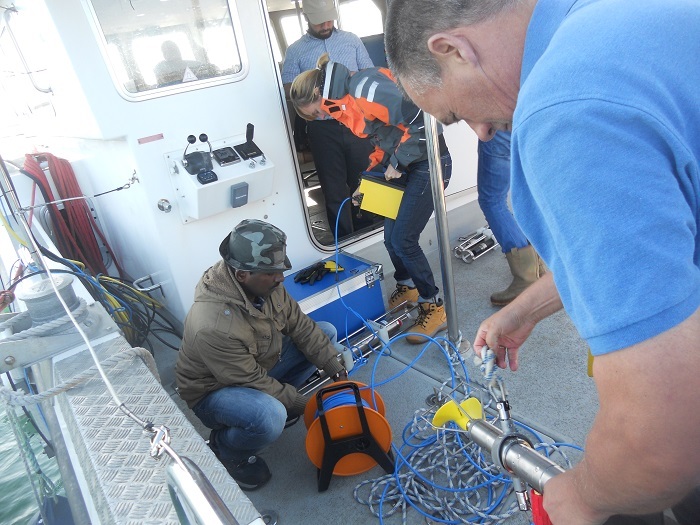 Week 1 involves gaining hands on experience with land survey equipment and using this to undertake the essential tasks required for hydrography, such as installing horizontal and vertical control for survey operations and in carrying out the vessel dimension control survey. Week 2 takes students onto our dedicated survey training vessel where they will gain practical experience with mobilising, calibrating and operating a range of modern hydrographic equipment and software such as multibeam echosounders, motion reference units, GNSS, sidescan sonar, magnetometer and sound velocity profilers to name only a few. During Week 3 students spend the first half of the week working on the vessel again, but this time with the mobilisation, calibration and general operation of USBL systems, and the second half of the week in gaining valuable management and leadership training in the context of the offshore industry from dedicated professionals in this field. Students also spend time working with the data they collected during week 2 within various modern data processing software packages such as QPS QINSy, Qimera, and Fledermouse and CARIS HIPS. In designing the course content and the practical exercises the requirements of the IHO S5 document have been central to the course content coupled with experience and knowledge of current commercial practice and equipment. The central aim of the course is to develop individuals so that they have “a practical comprehension of hydrographic surveying to enable them to carry out the various hydrographic and cartography tasks”. Once the student has completed the course, they will have an advanced level understanding of the requirements of survey, the importance of attention to detail and the practical skills that will allow them to undertake the basic functions of survey data gathering, recording, processing and presenting. There is a supporting e-learning package that accompanies this residential module, lasting for 5 weeks before and 8 weeks after the practical session. This covers more theoretical detail and background to the land surveying techniques and maths involved. The e-learning is provided using our innovative web app and the lectures are fully supported by an academic tutor for each student. The module takes place in Plymouth and teaching in held in the excellent new Plymouth University Marine Station on the historic waterside. Accommodation and lunch are provided within the cost. An updated version of the popular ‘Hydrography for Professionals’ practical residential education course will be delivered in May this year by Plymouth-based e-learning provider The Hydrographic Academy (part of the Marine Learning Alliance - MLA). The course is delivered several times a year in Plymouth, UK and in partnership with the University of Otago in New Zealand. The module is a Master’s level education qualification accredited by Plymouth University and is taught in their state-of-the-art facilities on Plymouth’s historic waterfront. Vessel and equipment facilities are provided by a range of industry experts including Fugro, Caris, Kongsberg and Sonardyne from their base in the city. The module is presented as the culmination of a year’s distance e-learning as part of the complete postgraduate diploma programme and allows 16 students to deploy their theoretical skills in a real-world environment supervised by academic experts and industry professionals from the Hydrographic Academy and Plymouth University. The unique ‘blended distance e-learning’ delivery method of the Hydrographic Academy allows students to remain earning in their jobs whilst using the innovative technology, professional academic tutors and hands-on experience of the latest equipment for the best possible learning. The Hydrographic Academy started as a department of Plymouth University in 2013, in response to a demand need for Master’s level professional Hydrographic education from offshore industry multinational Fugro. Building on the global reputation for marine subjects of Plymouth University, the success of the distance e-learning programmes offered led to the venture ‘spinning out’ of the University to a limited company owned by The IMarEST and winning a Times Higher Education Award for Outstanding Employer Engagement in 2014. The Marine learning Alliance now offers a MSc and BSc top-up in Sustainable Maritime Operations in addition to Hydrography and is currently branching out in to short e-learning courses in meteorology, oceanography, management and leadership. The IMarEST is an international membership body and learned society for all marine professionals. It is the first Institute to bring together marine engineers, marine scientists and marine technologists into one international multi-disciplinary professional body. It is the largest marine organisation of its kind with a worldwide membership of over 17,000 based in over 128 countries. What Can Satellites See form Space?